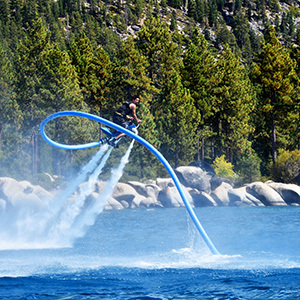 The Jetovator is a flying water sport propelled bike that hooks up to your existing Jet ski or Hydro-flight System. 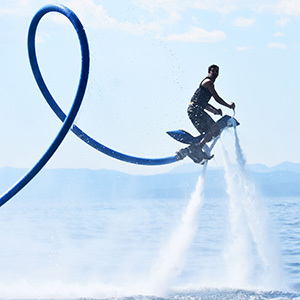 The Jetovator redirects the water thrust from the jet unit of the Jet ski along a sixty foot hose to the Jetovator Bike. This water thrust is then used to propel and elevate the Jetovator into the air. Call us for more information on +44 1934 712985 or email info@globalcmarine.com. 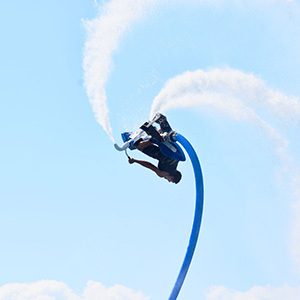 The sixty-foot connecting hose is attached to the PWC via a supplied thrust adaptor that redirects the jet thrust 180 degrees towards the front of the PWC. This thrust adapter can be easily installed and removed, allowing the PWC to still be used as normal. The Jetovator frames are made of powder coated aluminum and the body is made of an impact resistant polyethylene. What is a Compact Thrust Adapter? Hooks up quickly and easily with 4 bolts and a connection strap to any Seadoo, Kawasaki or Yamaha PWC with 120 HP or more. Provides auxiliary steering so that the PWC operator retains some of the steering capacity while the Jetovator is in operation. This is perfect for directing new operators as they learn to fly and for assisting with stunts and performed by expert riders. 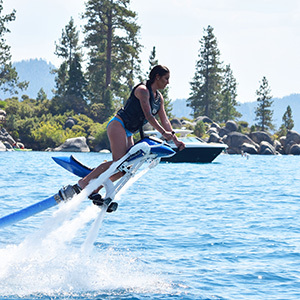 What kind of Jet Ski do you need? 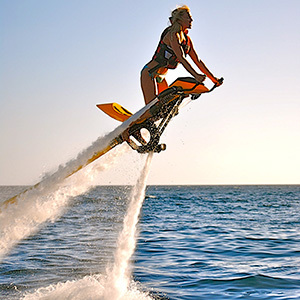 You can use any 4-stroke SeaDoo, Yamaha or Kawasaki personal watercraft. 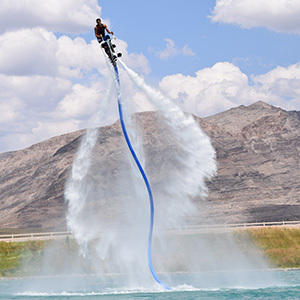 Although the Jetovator can be hooked to any personal watercraft. Does there have to be someone on the Jet Ski? There does have to be an operator on the Jet ski to control the throttle and to direct the ski. 20% of the thrust is directed out of the rear of the thrust adapter, so the jet ski operator retains some of the steering capacity. Professionals can use a fly-by-wire throttle manufactured by a different company. What is a double impeller? The double impeller is a Skat-Trak aftermarket part that reduces cavitation, decreases fuel consumption and adds the equivalent of 30HP to your PWC. We recommend that you have this installed at your local PWC repair shop. The average person is up and flying in less than 5 minutes. Up to 40 feet, but the Jetovator operator is in control of the height. So a beginner can cruise on 2 feet above the water if that is where they are comfortable. How much water pressure and water volume does it use? Around 1,000 gallons of water flows through the Jetovator every minute. There is an average of 50 psi out of all three Jetovator nozzles, and about 80 psi out of the thrust adapter into the connecting hose. The water thrust coming out of the nozzles is high volume low pressure, so that you can actually safely put your hand under the flow of water. The best length is 50-60 feet depending on how much HP your watercraft has. This keeps the Jetovator a safe distance from the ski while minimizing weight to the hose. What is included in the Standard Jetovator Kit? Each Standard Jetovator Kit comes with everything needed to easily hook up to your existing Jet Ski and fly. Your standard Jetovator kit comes in three main parts and there is some assembly required. Bike frame; with control nozzles, foot plates, body and pads. The compact thrust adapter with securing strap and adapter rings so you can hook up to any Yamaha, SeaDoo or Kawasaki. Swivelling connecting hose, designed to keep the hose from kinking so it is great for professionals and beginners alike. Are there additional options available? The removable Stainless Steel Stunt Swivel attaches to the thrust adapter and is used with your standard hose. The Double Impeller reduces cavitation, decreases fuel consumption and adds the equivalent of 30HP to your PWC. A Custom Powder Coat Colour option. We can get any colour powder coat to match your existing toys. There may be a three to four week wait time for custom orders. Is there a warranty on the Jetovator? The jetovator bike and thrust adapter come with a one-year manufacturer’s warranty. The connecting hose is a wear and tear item like the tires on your car, so it only has a six-month warranty. The hose warranty is also contingent upon the customer using and caring for the hose properly.